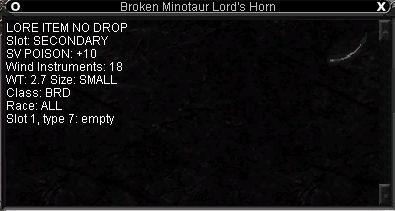 Yes, this is a BROKEN minotaur lord's horn. All you bards out there would do best to stay away from it. Went back to my old mino horn, and I'm much better off. This is not much of a wind instrument, as I expected. Think about it. It's broken! What sort of self respecting bard is going to use a broken horn? Yes, that's right. Me. But really, don't use it. It's not meant as a wind istrument, but as a quest component. All right, i got ahold of one of these a while ago. Dropped of a higher level mob than my mino horn, so I decided to use it, but I'm begining to wonder about the wisdom of that. Since I got it, I haven't seen my wind skill increase a single point, including those long swims around the Timorous Deep. Also, many wind songs seem to be less effective. My thoughts were, perhaps this instrument allows you to fill the requirements of wind required songs (ie. sonorous clouding) but does not allow the wind instrument skill bonuses. I effect, it is not really a wind instrument, but rather merely fulfills that requirement when equipped. Just a thought. I think it's back to the old mino horns for me, in any case. Does this have a wind increase? Or would I do best to stick with the normal mino horns? The quest for which it is needed is the Shadowknights' Darkforge Bracer quest. as far as i know, it is a good bard wind instrument, thats about it. IS this for a quest? if so which one?